Executive Order 6102 is a United States presidential executive order signed on April 5, 1933, by President Franklin D. Roosevelt "forbidding the Hoarding of gold coin, gold bullion, and gold certificates within the continental United States". The order criminalized the possession of monetary gold by any individual, partnership, association or corporation. The stated reason for the order was that hard times had caused "hoarding" of gold, stalling economic growth and making the depression worse. The New York Times, on April 6, 1933, p. 16, wrote under the headline "Hoarding of Gold", "The Executive Order issued by the President yesterday amplifies and particularizes his earlier warnings against hoarding. 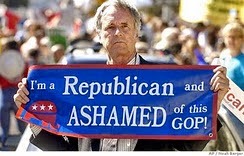 On March 6, taking advantage of a wartime statute that had not been repealed, he issued Presidential Proclamation 2039 that forbade the hoarding 'of gold or silver coin or bullion or currency,' under penalty of $10,000 and/or up to five to ten years imprisonment." The main rationale behind the order was actually to remove the constraint on the Federal Reserve which prevented it from increasing the money supply during the depression; the Federal Reserve Act required 40% gold backing of Federal Reserve Notes issued. By the late 1920s, the Federal Reserve had almost hit the limit of allowable credit (in the form of Federal Reserve demand notes) that could be backed by the gold in its possession (see Great Depression). If gold can’t be legally owned, then it can’t be legally redeemed. If it can’t be legally redeemed, then it can’t constrain the central bank. 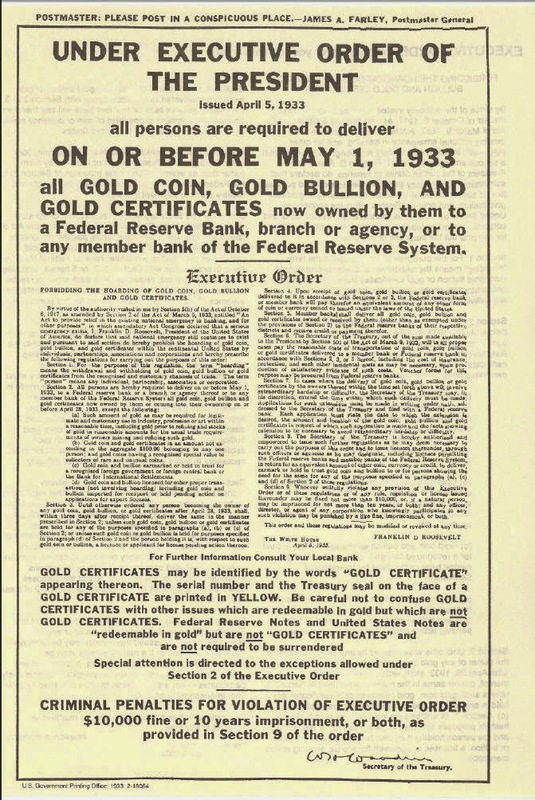 Executive Order 6102 required all persons to deliver on or before May 1, 1933, all but a small amount of gold coin, gold bullion, and gold certificates owned by them to the Federal Reserve, in exchange for $20.67 (equivalent to $376.58 today) per troy ounce. Under the Trading With the Enemy Act of 1917, as amended by the recently passed Emergency Banking Act of March 9, 1933, violation of the order was punishable by fine up to $10,000 (equivalent to $182,185 today) or up to ten years in prison, or both. Order 6102 specifically exempted "customary use in industry, profession or art"—a provision that covered artists, jewellers, dentists, and sign makers among others. The order further permitted any person to own up to $100 in gold coins (a face value equivalent to 5 troy ounces (160 g) of gold valued at about $6,655 in 2014). The same paragraph also exempted "gold coins having recognized special value to collectors of rare and unusual coins." This protected recognized gold coin collections from legal seizure and likely melting. The price of gold from the Treasury for international transactions was thereafter raised to $35 an ounce ($587 in 2010 dollars). The resulting profit that the government realized funded the Exchange Stabilization Fund established by the Gold Reserve Act in 1934. Executive Order 6102 also led to the ultra-rarity of the 1933 Double Eagle gold coin. The order caused all gold coin production to cease and all 1933 minted coins to be destroyed. About 20 illegal coins were stolen, leading to a standing United States Secret Service warrant for arrest and confiscation of the coin. A legalized coin sold for over 7.5 million dollars, making it one of the most valuable coins in the world. Numerous individuals and companies were prosecuted related to President Roosevelt's Executive Order 6102. The prosecutions took place under subsequent Executive Orders 6111, 6260, 6261 and the Gold Reserve Act of 1934. The circumstances of the case were that a New York attorney, Frederick Barber Campbell, had on deposit at Chase National over 5,000 troy ounces (160 kg) of gold. When Campbell attempted to withdraw the gold Chase refused and Campbell sued Chase. A federal prosecutor then indicted Campbell on the following day (September 27, 1933) for failing to surrender his gold. Ultimately, the prosecution of Campbell failed, but the authority of the federal government to seize gold was upheld, and Campbell's gold was confiscated. The case was cause for the Roosevelt administration to issue a new order under the signature of the Secretary of the Treasury, Henry Morgenthau, Jr., which was in force for a few months until the passage of the Gold Reserve Act on January 30, 1934. President Roosevelt issued new Executive Orders 6260, 6261 related to the seizure of gold and the prosecution of gold hoarders: also the Congress passed the Gold Reserve Act of 1934. Prosecutions of U.S. citizens and non citizens followed the new orders. Gus Farber, a diamond and jewelry merchant from San Francisco, was prosecuted for the sale of thirteen $20 gold coins without a license. Secret Service agents discovered the sale with the help of the buyer. Farber, his father, and 12 others were also arrested in four American cities after a sting conducted by the United States Secret Service. The arrests took place simultaneously in New York and three California cities, San Francisco, San Jose, and Oakland. Morris Anolik was arrested in New York with $5000 in U.S. and foreign gold coins. Dan Levin and Edward Friedman of San Jose were arrested with $15,000 in gold. Sam Nankin was arrested in Oakland. In San Francisco, nine men were arrested on charges of hoarding gold. In all, $24,000 in gold was seized by Secret Service Agents. David Baraban and his son Jacob Baraban owned a refining company. The Barabans' license to deal in unmelted scrap gold was revoked, so the Barabans operated their refining business under a license issued to a Minnie Sarch. The Barabans admitted that Minnie Sarch had nothing to do with the business, and that she had obtained the license so that the Barabans could continue to deal in gold. The Barabans had a cigar box full of gold-filled scrap jewelry visible in one of the showcases. Government agents raided the Barabans' business and found another hidden box of U.S. and foreign gold coins. The coins were seized and Baraban was charged with conspiracy to defraud the United States. In 1934, Congress passed the Gold Reserve Act of 1934 which ratified President Roosevelt's orders. A new set of Treasury regulations was issued providing civil penalties of confiscation of all gold and imposition of fines equal to double the value of the gold seized. Louis Ruffino was one individual who was indicted on three counts purporting to charge violations of the Trading With The Enemy Act. Eventually, Ruffino appealed the conviction to the Circuit Court of Appeals 9th District in 1940; however, the judgment of the lower courts was upheld based on the President’s executive orders and the Gold Reserve Act of 1934. Ruffino, a resident of Sutter Creek in California-gold country, was convicted of possessing 78 ounces of gold and was sentenced to 6 months in jail, paid a $500 fine, and had his gold seized. Foreigners also had gold confiscated, and were forced to accept paper money for their gold. The Uebersee Finanz-Korporation, a Swiss banking company, had $1,250,000 in gold coins for business use. The Uebersee Finanz-Korporation entrusted the gold to an American firm for safekeeping. The Swiss were shocked to find that their gold was confiscated. The Swiss made appeals, but those appeals were denied. The Swiss were entitled to paper money – but not their gold. Of course, after the gold was seized, there was a 1934 overnight increase of the price of gold from $20.67 per ounce to $35 per ounce. The Swiss company lost 40% of their gold's value if they tried to buy the same amount of gold with the paper money they received in exchange for their confiscated gold. Another type of de facto gold seizure occurred as a result of the various Executive Orders and it involved bonds, gold certificates and private contracts. Private contracts or bonds which were written in terms of gold were to be paid in paper currency instead of gold. This was in spite of the fact that these contracts and bonds all proclaimed that they were payable in gold, and at least one, the fourth Liberty Bond, was a federal instrument. The plaintiffs in all cases received paper money instead of (the contract terms') gold. The Supreme Court upheld all seizures as constitutional with Justices McReynolds, Van Devanter, Sutherland, and Butler dissenting. The Gold Reserve Act of 1934 made gold clauses unenforceable, and changed the value of gold from $20.67 to $35 per ounce, thereby devaluing the US dollar, since the dollar was gold-based. This price remained in effect until August 15, 1971, when President Richard Nixon announced that the United States would no longer convert dollars to gold at a fixed value, thus abandoning the gold standard for foreign exchange (see Nixon Shock). The private ownership of gold certificates was legalized in 1964. They can be openly owned by collectors but are not redeemable in gold. The limitation on gold ownership in the U.S. was repealed after President Gerald Ford signed a bill to "permit United States citizens to purchase, hold, sell, or otherwise deal with gold in the United States or abroad" with an act of Congress codified in Pub.L. 93–373, which went into effect December 31, 1974. P.L. 93-373 did not repeal the Gold Repeal Joint Resolution, which made unlawful any contracts that specified payment in a fixed amount of money as gold or a fixed amount of gold. That is, contracts remained unenforceable if they used gold monetarily rather than as a commodity of trade. However, Act of Oct. 28, 1977, Pub. L. No. 95-147, § 4(c), 91 Stat. 1227, 1229 (originally codified at 31 U.S.C. § 463 note, recodified as amended at 31 U.S.C. § 5118(d)(2)) amended the 1933 Joint Resolution and made it clear that parties could again include so-called gold clauses in contracts formed after 1977. Therefore ... I hereby proclaim that such gold and silver holdings are prohibited, and that all such coin, bullion or other possessions of gold and silver be tendered within fourteen days to agents of the Government ... for compensation at the official price, in the legal tender of the Government. All safe deposit boxes in banks or financial institutions have been sealed ... All sales or purchases or movements of such gold and silver ... are hereby prohibited. Your possession ... and/or safe deposit box to store them is known by the government from bank and insurance records. Therefore ... your vault box must remain sealed, and may only be opened in the presence of an agent of the Internal Revenue Service. By lawful order ..., the President of the United States. The first known reference to this hoax was in the book After the Crash - Life In the New Great Depression. That text refers only to gold, not to silver, which was added by 1998 to Internet references. It claims to be an Executive Order, yet whoever wrote the text wrote it to apply to specific individuals (e.g. "Your possession"), so if the text did originate from the government, it would have been sent to individuals, not published as an Executive Order. The first paragraph starts with the actual text of Executive Order 6102, then edits it slightly (e.g. changing "said national emergency" to "a national emergency" and "still continues to exist" to "still exists"), and then adds apparently made-up text. Due to the minor edits and how the real text and fake text are combined mid-sentence, it is almost certainly an intentionally designed hoax rather than an accident. Most of this text does not appear in the actual Executive Order. In fact, safe deposit boxes held by individuals were not forcibly searched or seized under the order and the few prosecutions that occurred in the 1930s for gold "hoarding" were executed under different statutes. One of the few such cases occurred in 1936, when a safe deposit box containing over 10,000 troy ounces (310 kg) of gold belonging to Zelik Josefowitz, who was not a U.S. citizen, was seized with a search warrant as part of a tax evasion prosecution. The U.S. Treasury came into possession of a large number of safe deposit boxes due to bank failures. During the 1930s, over 3,000 banks failed and the contents of their safe deposit boxes were remanded to the custody of the Treasury. If no one claimed the box, it remained in the possession of the Treasury. In October 1981, there were 1,605 cardboard cartons in the basement of the Treasury, each carton containing the contents of one unclaimed safe deposit box. In Australia, part IV of the Banking Act 1959 allows the Commonwealth government to seize private citizens' gold in return for paper money where the Governor-General "is satisfied that it is expedient so to do, for the protection of the currency or of the public credit of the Commonwealth." On January 30, 1976, this part's operation was "suspended". "Hoarding of Gold". The New York Times. April 6, 1933. p. 16. "How Money and Banking Work On a Gold Standard". Philosophical Economics. 28 July 2014. Retrieved 4 August 2014. Consumer Price Index (estimate) 1800–2014. Federal Reserve Bank of Minneapolis. Retrieved February 27, 2014. Roosevelt, Franklin D. (1938). Public Papers and Addresses of Franklin D. Roosevelt, Volume II, The Year of Crisis, 1933. New York: Random House. p. 352. OCLC 690922370. "The 10 most expensive coins and banknotes in the world". http://mentalfloss.com. Retrieved 4 March 2014. "Rare silver dollar coin sets world record auction price". http://abcnews.go.com. ABC News. Retrieved 4 March 2014. "Executive Order 6111 - Wikisource, the free online library". En.wikisource.org. Retrieved 2013-12-30. "Executive Order 6260 - Wikisource, the free online library". En.wikisource.org. Retrieved 2013-12-30. "Executive Order 6261 - Wikisource, the free online library". En.wikisource.org. Retrieved 2013-12-30. "Sequels". Time. November 27, 1933. "Gold Indictment No. 1". Time. October 9, 1933. "Bootleg Gold Ring Smashed in California: 13 Men Are Accused Of Violating Federal Restrictions". The Evening Independent. April 13, 1939. "FindACase | United States v. Scrap". Ny.findacase.com. Retrieved 2013-12-30. "Ruffino V. United States". Leagle.com. Retrieved 2013-12-30. "Uebersee Finanz-Korporation, Etc. V. Rosen". Leagle.com. Retrieved 2013-12-30. "FindLaw | Cases and Codes". Caselaw.lp.findlaw.com. Retrieved 2013-12-30. "Perry v. United States - 294 U.S. 330 (1935) :: Justia US Supreme Court Center". Supreme.justia.com. Retrieved 2013-12-30. United State Congress (August 14, 1974). "An Act to provide for increased participation by the United States in the International Development Association and to permit United States citizens to purchase, hold, sell, or otherwise deal with gold in the United States or abroad". Pub.L. 93–373. "Statements of Policy: Gold". FDIC Law, Regulations, Related Acts. Federal Deposit Insurance Corporation. United States Congress (June 5, 1933). "Gold Repeal Joint Resolution". 48 Stat. 112, Chapter 48, H.J.Res. 192. Norman v. Baltimore & Ohio Railroad Co. , 294 U.S. 240 (1935). 216 Jamaica Avenue, LLC v. S & R Playhouse Realty Co. , 540 F.3d 433 (United States Court of Appeals, Sixth Circuit 2008). Roosevelt, Franklin D. (April 5, 1933). "Executive Order 6102: Requiring Gold Coin, Gold Bullion and Gold Certificates to Be Delivered to the Government". "Josefowitz Gold". Time. March 2, 1936. Apcar, Leonard M. (October 15, 1981). "Treasury's Vaults Disgorge Treasures from the Depression: Memorabilia, Valuables Taken When Banks Were Closed May Be Opened For Claims". Wall Street Journal. Parliament of Australia (1959). "Banking Act 1959". Commonwealth Consolidated Acts. Commonwealth of Australia. Suchecki, Bron (August 4, 2008). "A History of Gold Controls in Australia". Gold Chat. Self-published. Text of Executive Order 6102 from The American Presidency Project.